Seems to be East Kent as death registrations for the 2 mentioned ar Ashford & Dover. As Sgt Fisher died instantly and his death is Dover registered -maybe that end of the world. can anyone track Jane Quick? I hope so I just recently spoke to someone who may have a copy of the Regimental War Dairies, I'll share what I find out, as i would love to no where this happend. I'm so proud of my families Military history and i have done much research over the last several months. 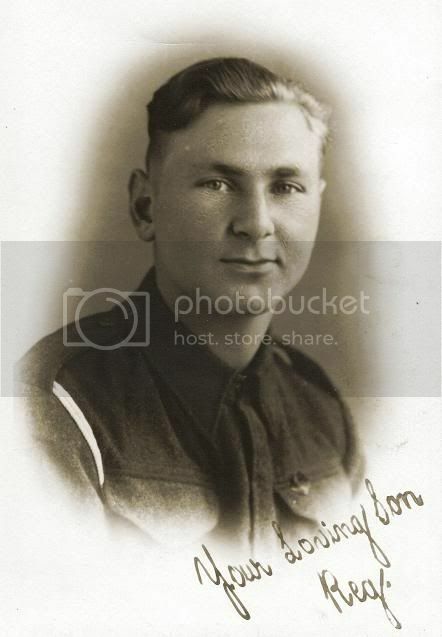 Reginalds story is the saddest as he was only in the forces one year before his death and had lost his brother Kenneth Walker 4 months earlier during the Battle of Croce at Coriano Ridge, Italy 9th September 1944. 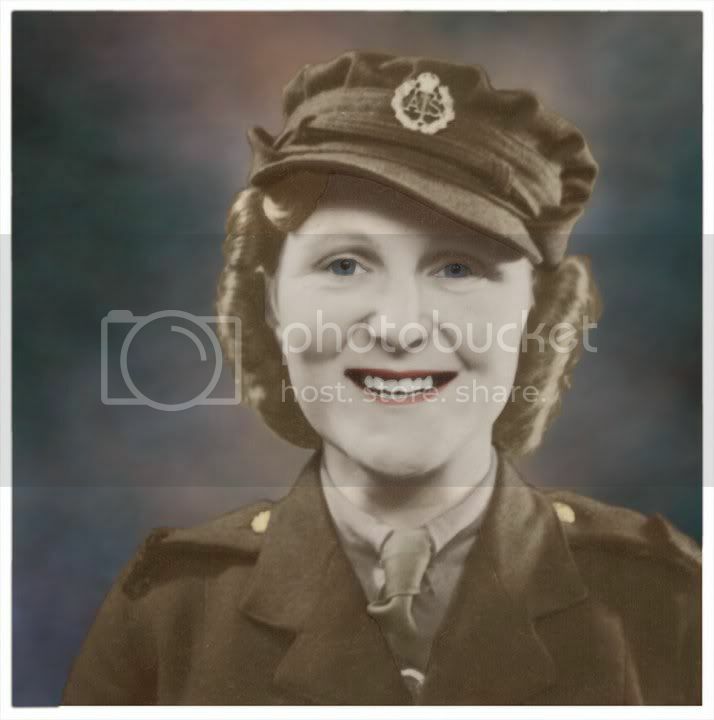 My Mum (Cherry Cliffe nee Laing) is the daughter of Eileen Laing (nee Walker) Reginald's Sister. 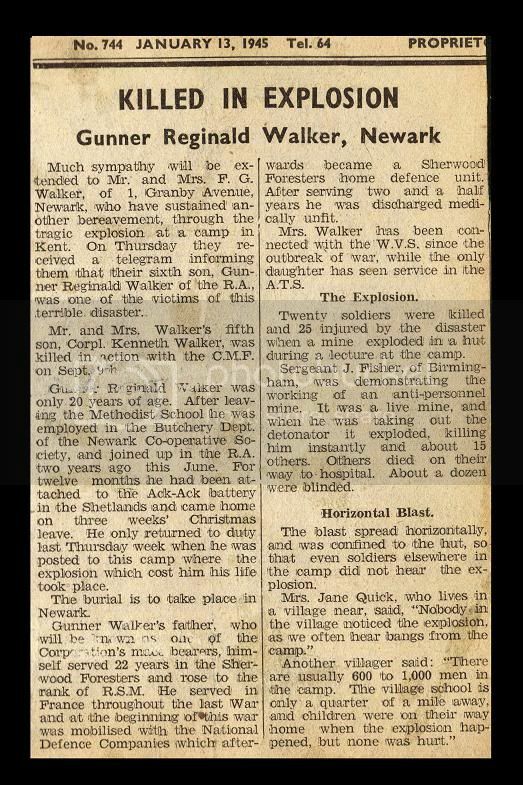 I maybe able to help a little with this query as my Grand Uncle Reginald Walker is one of the deaths mentioned in the list and I too am trying to find out where the explosion occured. Much sympathy ‘will be extended to Mr. and Mrs. F. G. Walker, of 1, ‘Granby Avenue, Newark, who have sustained another bereavement, through the tragic explosion at a camp in Kent. On Thursday they received a telegram informing them at their sixth son, Gunner Reginald Walker of the R.A. was one of the victims of this terrible disaster. 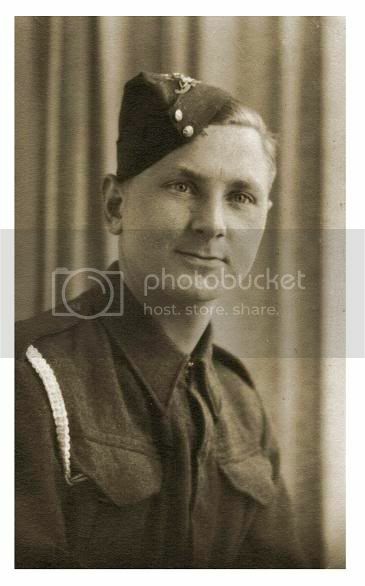 Mr. and Mrs. Walker’s fifth son, Corporal Kenneth Walker, was killed in action with the C.M.F. on the 9th September 1944. 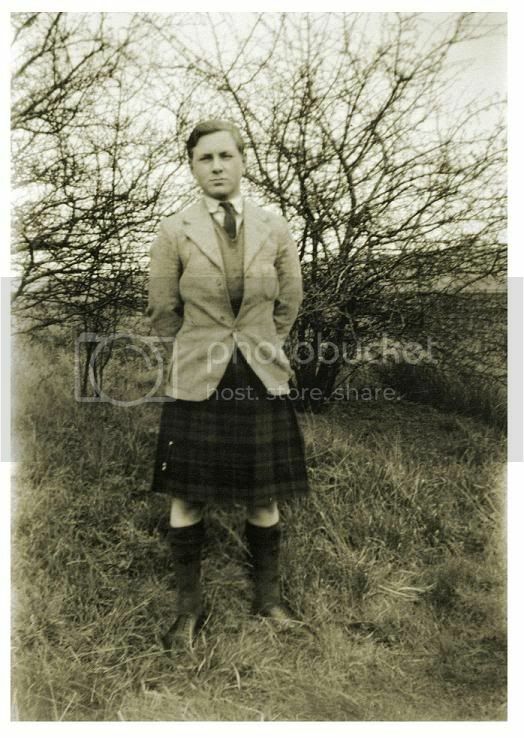 Gunner Reginald Walker was only 20 years of age. 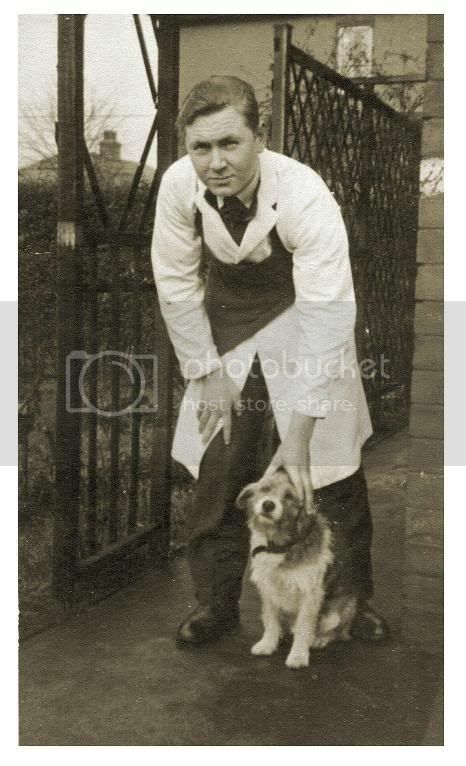 After leaving the Methodist School he was employed in the Butchery Dept. of the Newark ‘Co-operative Society, and joined up in the R.A. two years ago this June. For twelve months he had been attached to the Ack-Ack battery in the Shetlands and came home on three weeks’ Christmas leave. He only returned ‘to duty last Thursday week when he was posted to this camp where the explosion which cost him his life took place. The burial is to take place in Newark. 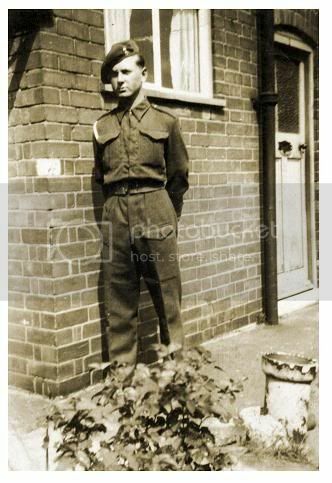 Gunner Walkers father who will be known as one of the Corporations Mace Bearers and himself served 22 years in the Sherwood Foresters and rose to the rank of R.S.M. 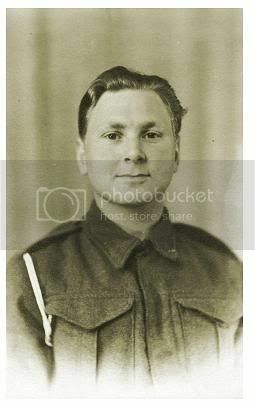 He served in France throughout the last War and at the beginning this war was mobilised with the National Defence Companies which afterwards became a Sherwood Foresters home defence unit. After serving two and a half years he was discharged medically unfit. Mrs. Walker has been connected with the W.V.S. since the outbreak of war, while the only daughter has seen service in the A.T.S. Twenty soldiers were ‘killed and 25 injured by the disaster when a mine exploded in a hut during a, lecture at the camp. Sergeant J. Fisher, of Birmingham, was demonstrating the working of an anti-personnel mine. It was a live mine, and when he was taking out the detonator it exploded, killing him instantly and about 15 others. Others died on their way to hospital. About a dozen were blinded. The blast spread horizontally, and was confined to the hut, so that even soldiers elsewhere in camp did not hear the explosion. 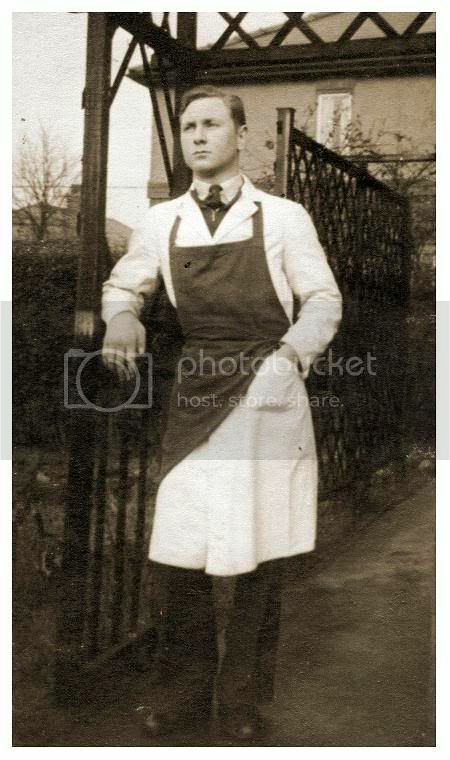 Edmund Jones age 21 yrs Ashford 2a 2036. Could well be him as it's the right qtr. I put " e jones 1945 ashford" into A**** ..Only four came up ,2 female and two males one R one E .As I dont have a subscription any more I cant go any further, but would assume the E is him. I've checked out Rogs original list and all except Jones E are Ashford deaths registered, Jones E, I couldn't find (6,049 Jones came up!!) 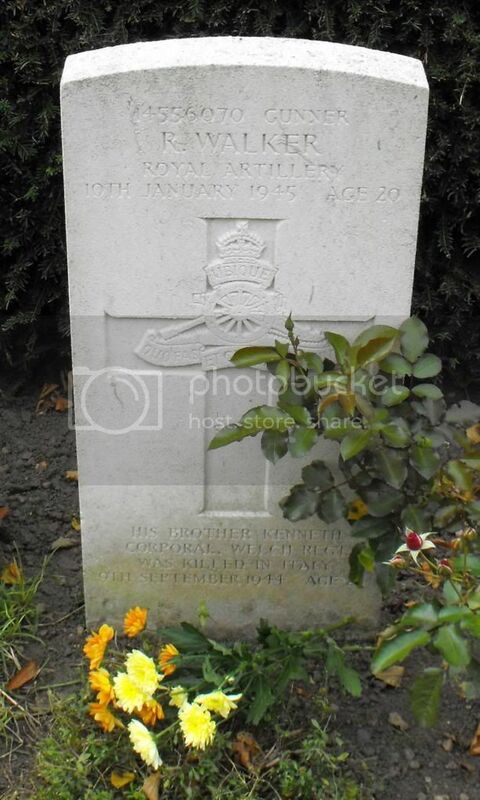 but on the basis several others of his unit died it is likely he is Ashford too. I also checked all Gunner deaths up to and including 16th but there were no Ashford or other Kent that fitted. Would it be possible to get a copy of the MOD or WD as it was then report of the incident. I am sure it would have listed full details of what and where event occured and names ranks etc of all involved. (Even though it was Wartime). I would have thought there would have been a Unit Inquiry at the very least . Ps:- I see there is a H Carter Essex Regmt. who also died 10/1/45 buried in Ashford Cemetry as well as W Ellis from the list. I'll check the rest of the names on Ancestry and see if I can find any dying after 10/1 from wounds. I think you'll hit the 70 year rule on info on the report as it will contain names of individuals. The report says Sgt Fisher was dismantling the mine but ommits to say if it was a British or Axis mine. It may be a long shot, but as the war was nearing its end the government started to train extra men for the purpose of lifting some of the beach minefields. Could this have been a batch of those men being trained as trainers to go back to their own regiments to teach others? I have seen papers on here that some one posts from Kew maybe they could have a looksee.. Would the report be kept there or would it have to be applied for from MOD under the "freedom of info"act.? Think you have cracked it Rog!! 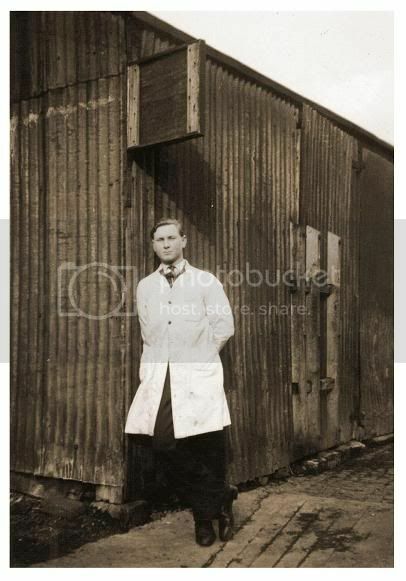 Logical but the report states "About 60 men from 52 regts were at the lecture in a nissen hut when the mine exploded. " so not necessarily Gunners unless it was broken down into individual RA regts. I tried using the CWGC search engine by date but realistically could only identify those not invoved because the burial was abroad. Not sure of the way forward to close this down, if the camp or units could be identified would a War Diary hold the answer ?